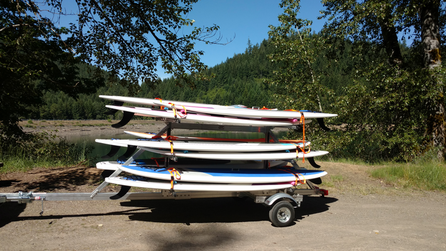 If you have a stand up paddle board longer than 10 ft, canoe or a raft, the State of Oregon requires a permit. NOTE: Invasive species permit IS included with rental from SUP2UOREGON (a $7 dollar value). See sample below. Surfboards, sailboards and kite boards. The Marine Board has adopted language setting the minimum age requirement for the Aquatic Invasive Species Prevention permit to age 14, making it consistent with Oregon's fishing license requirement. Manually-powered boats 10 feet or longer are required to have an Aquatic Invasive Species Prevention permit on board ONLY if the operator is an individual age 14 or older. Youth aged 13 or younger are NOT required to carry a permit. Note: All motorized boats under 10 feet are exempt from the permit requirement. What if I lose my permit? How do I get a replacement? No replacements will be issued. Boaters and paddlers will need to purchase another permit. Why do motorized boats pay $5 every two years and non-motorized $5 each year? Boat registration decals are non-transferable AND they adhere to the bow of the boat. However, manually-powered permits are transferable. The person can use it on other non-motorized craft. What about sailboats under 12 feet? Sailboats under 12 feet are NOT required to be registered with the Marine Board. So, if a sailboat is between 10 and 12 feet, the boater will also need a $5 annual permit. What about livery (rental businesses)? Non-motorized liveries will receive a quantity discount on permits which must be purchased directly from the Oregon State Marine Board. Clubs can purchase multiple permits for use by members and friends. 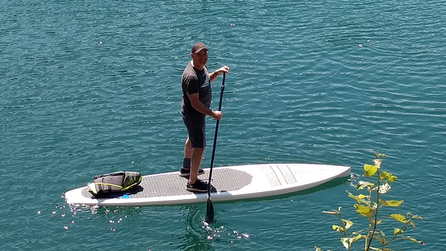 What about Stand Up Paddle (SUP) boards? Do they need a permit? YES. The USCG determined that SUP boards are considered boats for the purpose of life jacket requirements. Based on this determination, SUP boards that are 10 feet or longer, need to have a permit. What about boats in Washington or Idaho? Boats from Idaho that have an Idaho Aquatic Invasive Species Prevention sticker do NOT have to have an Oregon permit if boating within the main stem of the Snake River. Boats from Washington do NOT need an Oregon permit if boating within the main stem of the Columbia River. Boats from Washington or Idaho may launch in Oregon tributaries within ONE RIVER MILE of the Columbia or Snake rivers (common interstate boundary waters) without a permit, only for the purposes of accessing the Columbia and Snake rivers. All manually-powered boats UNDER 10 feet are exempt from the permit requirement. Does this mean non-motorized boats will have to be registered? No. Non-motorized boats are NOT titled or registered under the program. Fees from permits are deposited directly into a fund dedicated to this program. The funds generated from the program do NOT contribute to the state's general fund. Some of the funds will be transferred to the ODFW to implement the boat inspection aspect of the program and Oregon State Police for law enforcement services. What about surfboards, sailboards or kite boards? Do they need a permit? No. Based on the definition of a "boat", these devices are exemp. All "boats" 10 feet long or longer WILL NEED an aquatic invasive species prevention permit. The AIS permit rule includes "manually powered boat" which requires an aquatic invasive species prevention permit. A "boat" is defined in ORS 830.005 (2): "Boat" means every description of watercraft, including a seaplane on the water and not in flight, used or capable of being used as a means of transportation on the water but does not include boat houses, floating homes, air mattresses, beach and water toys or single inner tubes. NOTE* All SUP2UOregon rentals come with the required aquatic species invasive prevention permit.